An open letter signed by more than a dozen organisations has urged Adur District Council to cancel this month’s meeting to decide plans for 600 homes and an IKEA. 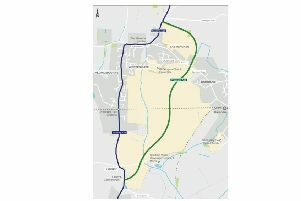 The letter, signed by groups including the Campaign to Protect Rural England (CPRE), Lancing Parish Council and Adur Floodwatch, implored the council’s planning committee not to make a decision ‘in haste’ on July 18. The date is scheduled for the council’s planning committee to determine the proposals for New Monks Farm, west of Shoreham Airport, first lodged nearly 18 months ago. But the 13 concerned organisations believe not enough time has been given to allow the community to consider comments from statutory consultees after last-minute arrivals. Adur Residents Environmental Action (AREA), which signed the letter, said some consultee responses appeared on the council’s planning portal after the official deadline for public comments passed. The New Monks Farm meeting will be chaired by councillor Pat Beresford, after usual chairman Carol Albury decided she could not participate in the meeting as she had already made up her mind to oppose the plans. Mr Beresford, re-elected to the council in May after a two-year absence, defended his ability to take the chair. Before losing his seat in 2016, he oversaw the initial production of the Adur Local Plan – a document which went on to include New Monks Farm as an area for potential development – as cabinet member for regeneration. He said: “My interest in the local plan ended in May, 2016. There was nearly two years of activity after I left. “I think people need to understand that a local plan and a planning application are different animals. Adur District Council today (July 6) confirmed the meeting would not be delayed. A spokesman said: “We are entirely satisfied that there is no need to delay the meeting of the planning committee to consider the application at New Monks Farm. As with all applications, large and small, this will be decided on its merits solely using planning criteria set for such matters by statute.